Just how powerful are France’s labour unions? Their capacity to organise paralysing strikes sets them apart from unions elsewhere, but is their influence declining? Paris, France – A few days into the European football championship, Irish and Swedish fans in green and yellow football shirts stood bewildered amid the crowd at a Parisian train station. They had unexpectedly discovered a French speciality: a railway strike in opposition to a labour law reform,enacted after four months of social unrest, had cut the main line leading to the stadium, forcing thousands of fans to make last-minute travel arrangements. In June, the French strikes made international headlines as rubbish piled up in the streets, trains and planes were cancelled, and oil refineries paralysed – overshadowing the start of one of the world’s biggest sporting events. Although France hosted more than a million tourists for the tournament, while being under a state of emergency since the attacks in November, French workers did not relinquish their right to strike. From March to July, unions organised 12 days of protests and strikes opposing a new labour law that “offers total freedom to employers and constitutes a historical setback for workers’ rights”, according to the General Confederation of Labor (CGT), France’s biggest and oldest union. Its main contested articles were the introduction of a 46-hour working week – up from 35 – allowing employers to lower wages for extra work hours, and facilitating lay-offs for economic purposes. On July 21, Prime Minister Manuel Valls used Article 49-3 of the constitution, allowing the government to force through the legislation without a parliamentary debate and vote. This action, criticised by both the right-wing opposition and socialist dissidents, abruptly ended four months of social unrest. Francois Fillon, a member of the right-wing opposition Republican party and former French prime minister, decried the move on French radio as “the symbol of Hollande’s term: imposture and incompetence”. In response, unions called for new strikes and protests in September. The right to strike, enshrined in France’s constitution, has shaped the country’s social structure. 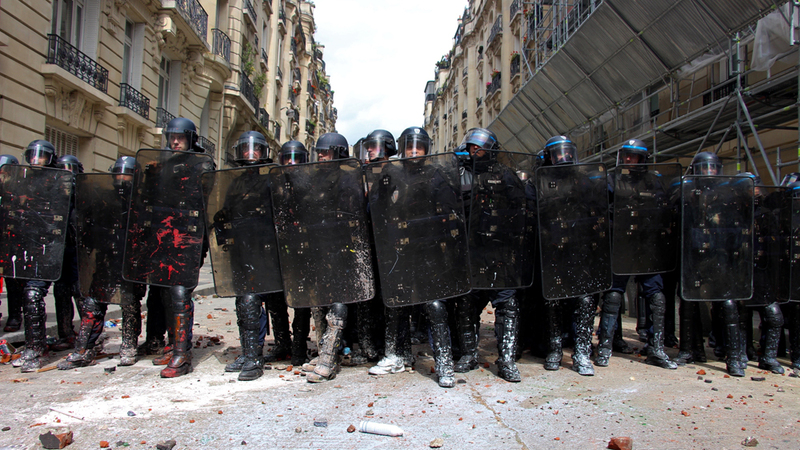 In an era of global economic liberalisation, France’s propensity for paralysing strikes stands out as a rare exception, but for how much longer? The right to strike, introduced in the 1946 French constitution, allows employees to stop working in order to put forward professional and social claims. “Without a right to strike, workers cannot act directly. A strike is not only a refusal to work, it makes workers convene, debate and vote on appropriate means of protest. In this way, it allows them to take their future into their own hands,” explains Celine Verseletti, a member of the CGT union’s leadership board. For Michel Wieviorka, a renowned French sociologist and author of several books on social movements, “the right to strike is a shield against arbitrary corporate power and decisions taken by a government without prior negotiations”. “Historically, massive strikes during which unions successfully blocked the country’s entire economy fostered social progress,” he told Al Jazeera, referring to the great strikes of 1936 and 1968. In 1936, around six million workers blocked and occupied factories, leading to significant wage rises and the advent of annual paid leave. The year 1968 saw France’s largest modern social movement when, in the wake of a student revolt, some nine million striking workers obtained a 35 percent increase in the minimum wage and the legalisation of union representation within companies. “When unions have members in the economy’s key sectors, they hold considerable power once they decide to use their right to strike or threaten to use it,” explains Wieviorka. In France, strikes affect both the private and public sectors. From railways and airports to oil refineries, energy plants and waste disposal facilities, they target the country’s vital infrastructure with the aim of paralysing activity. Strikes became essential to French union power and their capacity to negotiate with the government and corporations. “In order to create a dialogue in which workers will be taken into account, a balance of power has to be created. Using our right to strike is what creates it,” says Verseletti. While unions may compensate striking workers for the loss of their salary with a dedicated solidarity fund, strikes result in important financial losses for corporations. Due to strikes in refineries in May, oil and gas multinational Total’s losses were estimated at around 45 million euros by the French newspaper Le Figaro. Airline Air France announced losses amounting to more than 40 million euros in the months of May and June. For the national railway company SNCF the cost reached 310 million euros over the same period. In a globalised economy, strikes do not come without consequences. Beyond being a nuisance for those who see their trains or flights cancelled, or queue for hours at a petrol station, they may prompt multinational corporations to reconsider investing in France. “In our global times, they cause companies and investors to leave for countries where workers are not organised, where strikes do not exist and where, as a result, labour is cheaper,” explains Wieviorka. In May, Total’s CEO Patrick Pouyanné threatened to seriously reconsider the group’s investments in the French refinery sector. “There are always two conflicting points of view, one of order and economic efficiency and one of progress and social justice. Of course, those defending the right to strike stand with the second,” says Wieviorka. Rarely have other countries made international headlines for massive strikes so often over the past decade. In 2006, 2009 and 2010, social movements against reforms to the country’s laws on contracts, retirement and labour rights, respectively, prompted millions of people around the country to strike and take to the streets in protest. The French case is particular because, although “strikes exist in many other countries, in France they have a specific impact as unions are often more radical than anywhere else,” explains Wieviorka. “In 1906, union leaders signed a foundational document, the Charter of Amiens, which established an absolute separation between unions and political parties,” he continues. Verseletti underlines that these dynamics continue to shape union-government relations today. “In other countries striking is a last resort, whereas for us it is fundamental means of action. We need to start negotiations in a position of power. Without it there is no dialogue and they [the government and employers] will try to impose everything upon us,” she says. “It is usually not the case in other countries where consensus is easier to reach, even with the corporate executive level. In France we are used to frontal confrontations,” she adds. 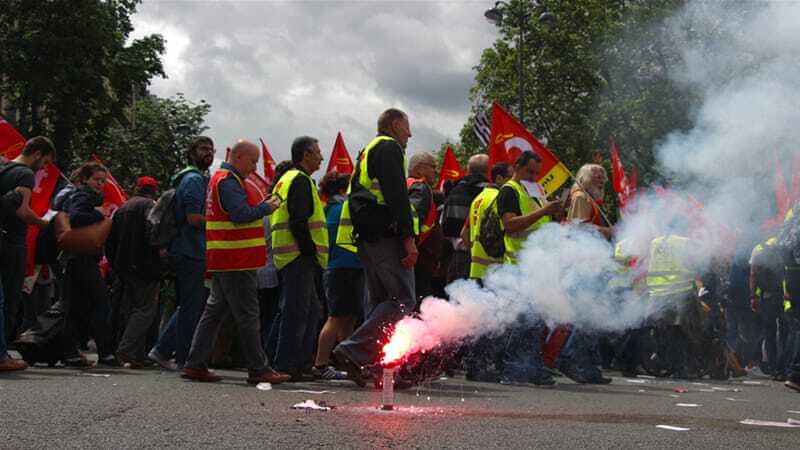 French unions’ capacity to organise paralysing strikes in strategic economic sectors, and their propensity to do so, is what has set France apart in the recent history of union struggles. “While we do not have the largest membership rate compared with other countries [11 percent in France compared with a European average of 23 percent, according to a 2016 Ministry of Labour study], labour unions from other countries often ask us how we manage to involve so many workers. “I believe our functioning is unique. We are autonomous entities with an internal democratic structure. Our goal is to directly involve a maximum of workers rather than delegate their voices to union leaders whose sole purpose is to negotiate with the executive,” explains Verseletti. Because of their relatively low memberships rate, French unions are sometimes accused of abusing their power and taking the rest of the population hostage. Unions denounced the government’s use of article 49-3 of the constitution to push through the controversial labour law without a parliamentary vote as an example of its rising authoritarianism. “The government has adopted a very authoritarian posture. Not only have they refused dialogue but repression has also been stronger. We have been mobilised for four months without success,” says Verseletti. President Hollande’s threats to forbid a protest after clashes between demonstrators and police in June, before authorising it within a perimeter enclosed by police, who searched entering demonstrators, was a heavily symbolic act, unusual for a socialist government. Union activity also suffers from an increasingly restrictive private sector. “It has become harder to organise general strikes because a lot of employees face pressures from employers and fear for their jobs and careers. There are also more workers on short-term contracts and more small businesses, which makes it hard for union culture to develop,” explains Verseletti. “With the liberalisation process, workers need their capacity to strike and establish a power relationship even more. Workers will always need to fight for their rights and better living conditions. We believe unions are a counter power essential to democratic life,” she adds. 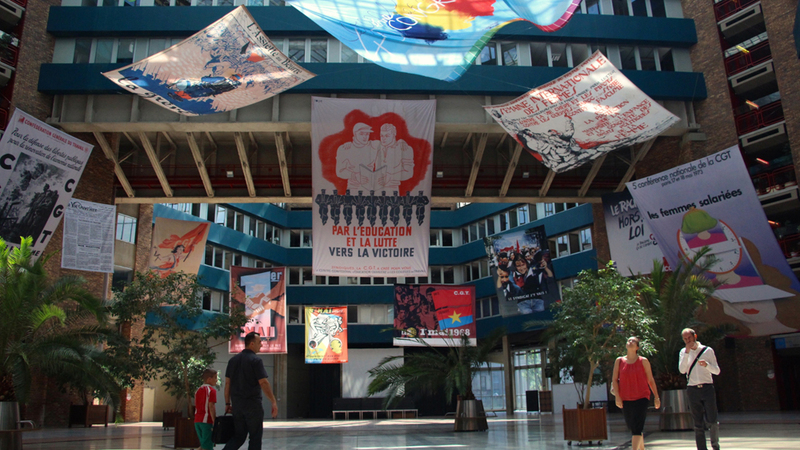 As their influence comes under greater pressure, the historical capacity of French unions to organise paralysing strikes and push for a consensus between economic reform and safeguarding social gains will be tested as the social movement resumes in September.